The evaluation and treatment of bladder cancer is a complex process that typically involves multiple procedures and care providers. Our research aims to improve the care of all stages of bladder cancer through clinical and basic science research. Below we have outlined several of our current and future research projects. During the past two decades, several revolutionary immunotherapy approaches have taken center stage in cancer therapy. However, there is still an unmet need for cancer patients that do not respond to immunotherapy in all stages of bladder cancer. Our research team at the University of Florida has discovered that bladder cancer patients have an increased number of immune cells that are suppressed and cannot fight bladder cancer effectively. Additional studies revealed that by specifically targeting these immune cells we may be able to remove this suppression and improve the cancer fighting ability of these immune cells. Future research would build upon these findings and explore if we can improve patient outcomes by targeting these immune cells and use the body’s own cancer fighting capabilities. Urothelial carcinoma most often occurs in the bladder, but can also develop in the ureter and kidney. Treatment for urothelial carcinoma of the kidney and ureter is based on surgical removal of these organs. The bladder is the most common site of disease recurrence following surgery. 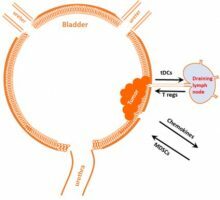 Prior studies have demonstrated that instilling mitomycin chemotherapy into the bladder following surgery can significantly reduce the rate of bladder tumor recurrences after surgery. 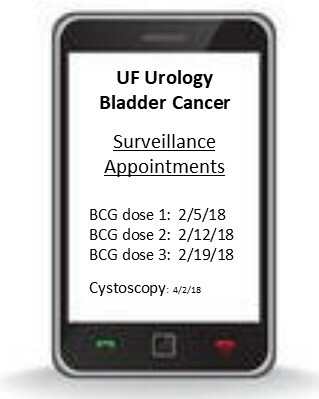 Research from the University of Florida suggests that we can decrease the risk of bladder tumor recurrence even further if this chemotherapy is instilled in the bladder during the surgical procedure. Based on this initial finding we have designed and initiated a clinical trial to further evaluate the timing of mitomycin instillation to decrease bladder tumor recurrence in patients being treated for urothelial carcinoma of the kidney and ureter. The standard treatment of BCG refractory bladder cancer is bladder removal surgery with urinary diversion. This surgery has a profound impact on all aspects of a patient’s quality of life. Many molecular targets have been identified in stage I bladder cancer, but we do not know how these molecular targets change over time and how these changes may impact response to treatment. This study aims to first evaluate several potential therapeutic molecular targets in patients with bladder cancer before and after BCG treatment. This data will then be utilized to develop a clinical trial targeting one or more of these targets in patients wishing to avoid bladder removal surgery. Many patients with intermediate/high risk non-muscle invasive bladder cancer will require administration of BCG into their bladders on a routine basis. Unfortunately, this can be costly in terms of time and monetarily to patients, difficult from a scheduling point of view, and difficult to know the true impact this has on patients apart from the cancer treating benefit. The design of this app will allow for greater patient involvement in their own care, as well as a means to track their symptoms and quality of life as they traverse the treatment schedule. Furthermore, it allows for tracking of missed treatment sessions and the ability to quantify financial costs associated with treatment visits. Finally, this information can then be used by physicians to help determine how to improve patient treatment, access to treatment, quality of life, and patient involvement. How Can Patients Contribute to Research and New Discoveries at UF Department of Urology? Research funding from national sources are severely limited and often cutting edge studies such as listed above are supported in part by patients and their family members who are interested in contributing to furthering the understanding of urologic diseases and their treatments. Your contributions to these new discoveries may translate into direct patient benefits and to improving the future care of individuals with similar conditions. For patients who may be interested in supporting the Department of Urology or specifically Dr(s). Kusmartsev, Crispen, or O’Malley’s research efforts with a monetary gift, please click the link below. Gifts ranging from a few dollars to a larger endowment for establishing a program or center of excellence have been made by patients in the past. Gifts of any size are greatly appreciated.